NOTE: Expert Q & A is an occasional feature of RR where we tap a local expert for information on succulents or other plants. Our expert this post is Buck Hemenway, UCR Master Gardener, succulent propagator (website here) and gracious expert on succulents the world over. Q: While walking through White Park in downtown Riverside, I was taken aback to see Century plants I’d featured in an earlier post (click here) looking quite different. Back in March these plants were in full, gorgeous, golden flower and looking quite healthy. Today, while they still featured tall stalks, the flowers had been replaced by mini versions of their parents … tons of them! As for the parent plant, they look dead and dried out. Is something strange going on with these once-beautiful plants? A: Not very unusual. 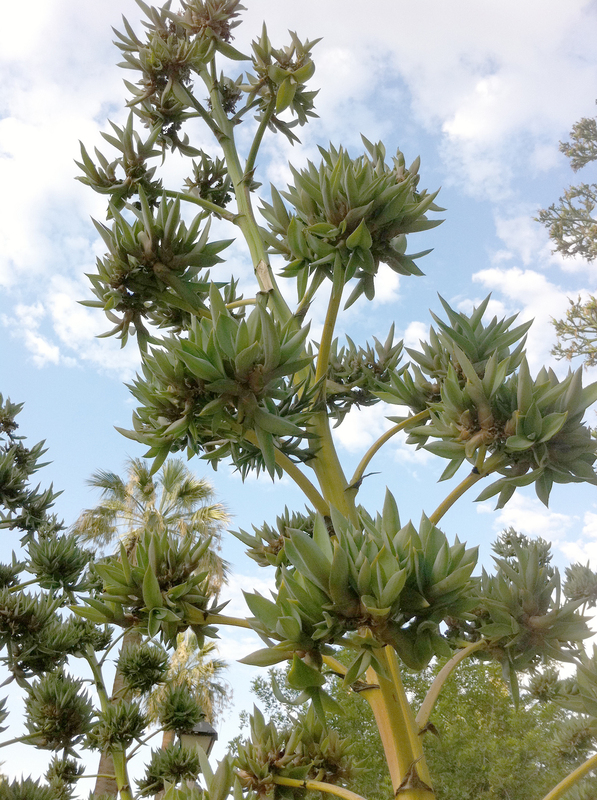 This is a common form of propagation in the Agave family. About 30% of the species do this. Agaves are very good mothers. Since they spend so long getting ready to procreate, they have developed a number of methods for doing so. As you know, many Agaves produce plantlets on underground runners that we call “pups”. The amazing bloom stalks set seed in the millions. Each seed pod has hundreds of flat seeds stacked up like Pringles in a three sided pod. Then some of them produce “bulbils” which is what you are seeing. These are produced at the bud axils from the flowers and each is a viable plant. You can see how these plants are producing hundreds of them on each bloom stalk. For the most part, the little ones will finally decide that “now’s the time” and just fall off of the bloom stalk and root. The ones in the pictures should be far enough along that you can prize one off and actually see the little root nubs forming at the base of the plantlet. They will root in a very few days. Usually, here in the Inland Empire, the fall winds will do them in and blow them over. 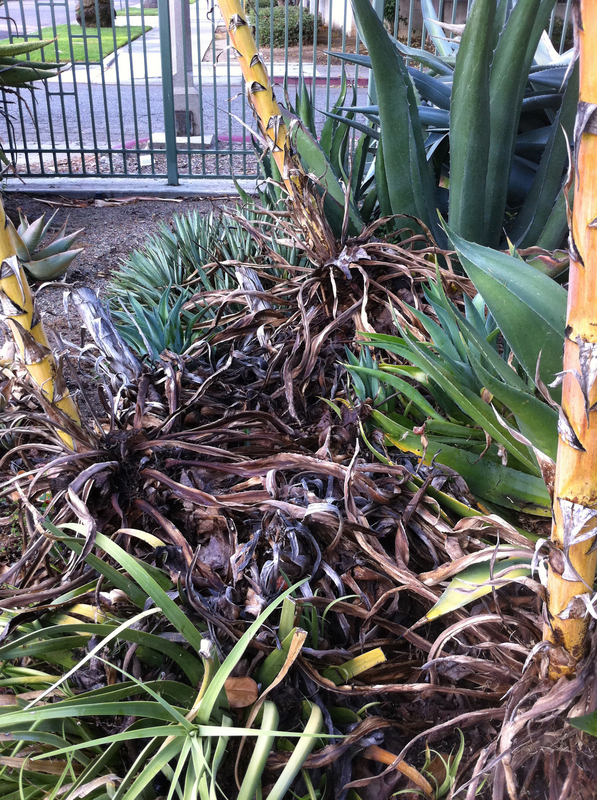 You’ll remember that as the Agave blooms, it stops taking nourishment from the soil, which means that the roots desiccate and you’re seeing the leaves do to the same. The bloom stalk then outweighs the base by a large multiple and winds become the enemy of the mother plant and the propagator of the baby plantlets (bulbils). Amazing plants, our Century Plants. They provide so much beauty in their prime and astound us when they spend their life forces to reproduce. 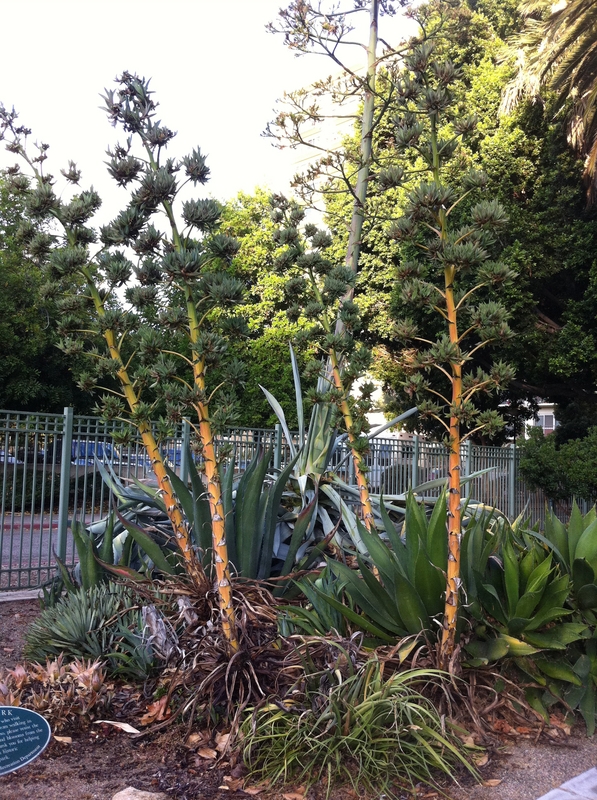 These look to be Agave desmettiana, but I can’t be sure. That’s a really nice mix of agaves. I love the really big ones like the blue tinged one in the back. Did you click on the link to how they looked back in March? So gorgeous! Do you remember when I asked you about the plants of your neighbor’s? I didn’t know that these beautiful plants were at Whites Park. It’s been all to long since I’ve wandered thru there!! And the cousin who wanted the pics will be here in a couple of weeks!! Thanks again for your wanderings. Cool … glad I could help, if only accidentally!